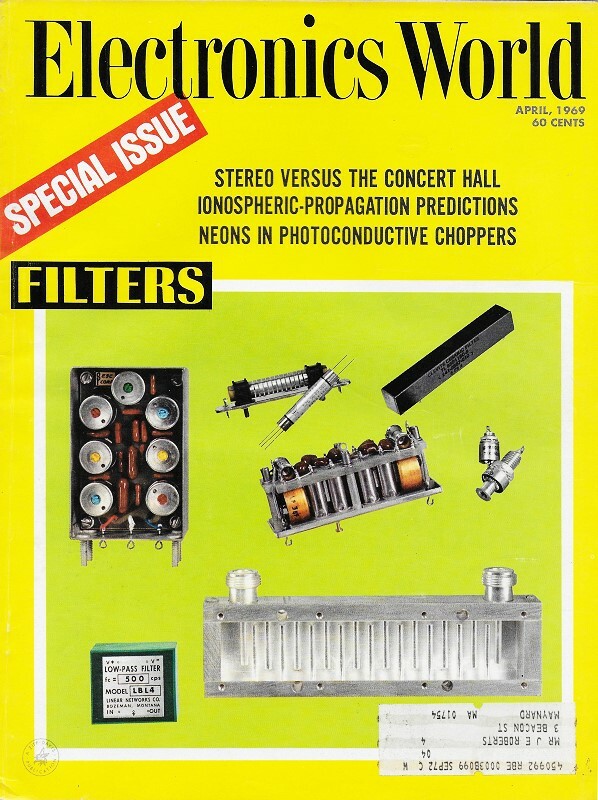 The April 1969 issue of Electronics World included a large number of articles on the topic of filter design and use. Included were titles such as "LC Filters," "Practical Operating Limits for Filters," "Filters for Microwave," " Crystal Filters," and others which were contributed by experts in the field from industry and academia. Check the table of contents to see which ones have been posted here. This article on the use of ferrite beads for blocking RF signals is more of a sidebar note than an article, but it's still worthy of inclusion. Ferrite beads and toroids are still widely employed for stopping radio frequency interference (RFI) on everything from AC power cords to millimeter-wave circuit boards. Typical ferrite bead and its equivalent series circuit. Block spurious noise without d.c. losses? It can be done with a ferrite bead says the Electronic Components Division of Stackpole Carbon Co. They claim a ferrite bead is one of the simplest and least expensive methods of obtaining r.f. decoupling, shielding, and parasitic suppression without sacrificing low-frequency power or signal level. Unlike conventional r.f. chokes, ferrite beads are compact; they do not couple to stray capacitance to introduce detuning or spurious oscillations. In addition, their impedance varies from quite low at low frequencies to quite high at noise frequencies. What else makes them different? Well, they need not be grounded, but grounding isn't detrimental to performance if they should touch the chassis. Ferrite beads are available in a variety of sizes, from 0.038 inch o.d. and 0.150 inch long to 0.120 inch o.d. and 0.300 inches long. They come with either a single hole or multiple holes through their length, through which the current-carrying conductor passes. Some beads are being made with leads to which wires can be soldered. Here's how they work. As noise current flows through a conductor (passing through a ferrite bead), it creates a magnetic field. As the field passes through the bead, the permeability of the bead at the noise frequency (r. f.) causes the impedance of the bead to rise rapidly, creating an effective r.f. choke. The higher the frequency, the higher the impedance and the greater the attenuation. Meanwhile, low-frequency current passes through the bead unimpeded. Several beads can be strung together for increased efficiency.